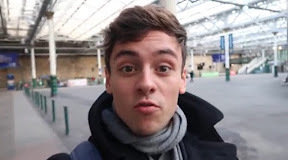 TOM Daley confessed he let commuters get more than an eyeful of his trunks on a trip to Glasgow. The Olympic diver was in Glasgow and Edinburgh at the weekend to do a book signing when he accidentally flashed his trunks to everyone one the train. Luckily he didn't have them on at the time. He revealed: "The train journey was pretty beautiful although my trunks were hanging down from the baggage rail over the seat the whole time and I had no idea." 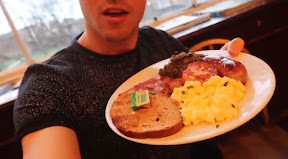 During his trip Tom had fried breakfast complete with haggis at the Elephant House Cafe where JK Rowling wrote Harry Potter. He admitted it was a bit weird seeing all the Harry Potter graffiti in the toilets. He also had to buy a pair of earmuffs after getting overly chilled during a trip up to the Castle. 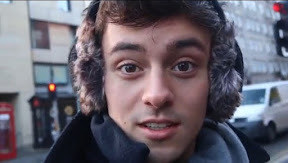 He revealed: "My ears got so cold that I had to get these ear muffs. Cool eh?" He also squeezed in a trip to Edinburgh's Commonwealth Pool to train for some synchronised diving. He said: "I had a really funny couple of days in Scotland."